Looks like a new planting from the nursery. Being exposed like that, out in the open, usually dries out the tender leaves that grow in a well sheltered nursery environment. This is why it is recommended to 'harden' off new purchases, as going directly into full sun and more variable and dry breezes/winds, is a big shock for them. The leaves that formed in the sheltered nursery were adapted to still and moist conditions, shaded from direct sun. So they had larger pores, which transpire water much more readily. Out in the open and exposed to winds and variable humidity, those larger pores allow far too much water to be drawn out. It's like every leaf on the tree is a hole in a dam. That water loss can only be plugged by loosing the leaves. Leaves can slowly adapt to new conditions, but dramatic condition changes means adaptation won't be quick enough before the leaves do more damage than good. They dry out and die. The new leaves that form in the new conditions will be adapted to the amount of sunlight and rate of water transpiration out in the open. Pores will be smaller, to keep more water inside the tree, and they'll have a better balance of chlorophyll for photosynthesising the extra sunlight it gets. I don't think your tree is doomed. The stem still looks like it will come back, but it has definitely gone backwards. There is a lot of information about how best to plant new avocados. It is one of the most talked about topics in the fruit growing galaxy. 1. It wasn't 'hardened' off to go out into full sun. 2. It wasn't planted with drainage in mind. 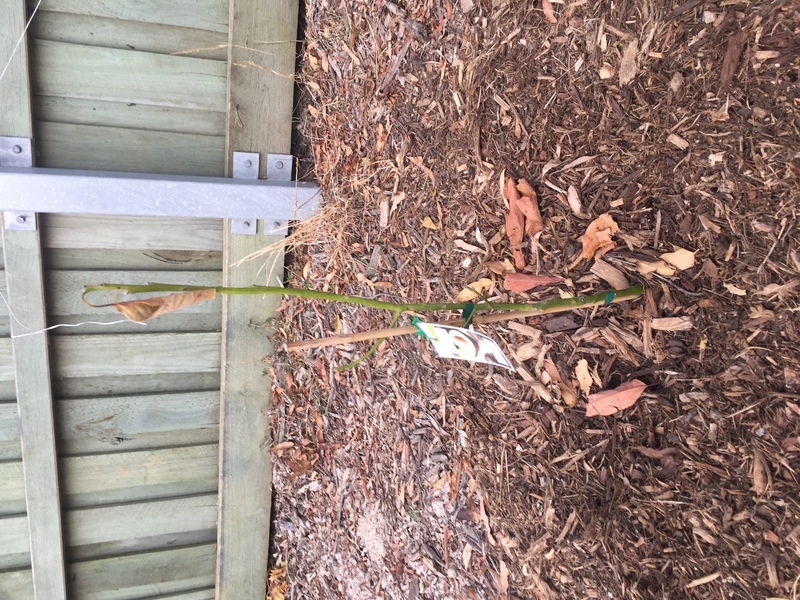 Just about everyone will suggest mounding the surrounding area to ensure that excess water can more freely drain away, as avocado are susceptible to disease and rotting if they sit in soil that remains too wet. 3. It wasn't sheltered from the elements (drying/damaging winds and harsh sun). Kind of related to point 1. I don't know the aspect of what's around it and whether or not the fence provides afternoon shade. Outside of soil tests, fertiliser choices and many other factors, if you address those three points, it will give the tree a much better footing to become better established. One thing that does bug me every now-and-then is the suggestions that are given for the recommended sun/shade for plants. Many trees are recommended as 'full sun' so people but them and plonk them out in full sun. Then they wonder why this happens to them. Those recommendations are for established trees, but coming from the nursery they need to be sheltered until they do get established.